Cambridge, Mass. – February 19, 2015 – Most lenses are, by definition, curved. After all, they are named for their resemblance to lentils, and a glass lens made flat is just a window with no special powers. But a new type of lens created at the Harvard School of Engineering and Applied Sciences (SEAS) turns conventional optics on its head. A major leap forward from a prototype device demonstrated in 2012, it is an ultra-thin, completely flat optical component made of a glass substrate and tiny, light-concentrating silicon antennas. Light shining on it bends instantaneously, rather than gradually, while passing through. The bending effects can be designed in advance, by an algorithm, and fine-tuned to fit almost any purpose. With this new invention described today in Science, the Harvard research team has overcome an inherent drawback of a wafer-thin lens: light at different wavelengths (i.e., colors) responds to the surface very differently. Until now, this phenomenon has prevented planar optics from being used with broadband light. Now, instead of treating all wavelengths equally, the researchers have devised a flat lens with antennas that compensate for the wavelength differences and produce a consistent effect—for example, deflecting three beams of different colors by the same angle, or focusing those colors on a single spot. “What this now means is that complicated effects like color correction, which in a conventional optical system would require light to pass through several thick lenses in sequence, can be achieved in one extremely thin, miniaturized device,” said principal investigator Federico Capasso, the Robert L. Wallace Professor of Applied Physics and Vinton Hayes Senior Research Fellow in Electrical Engineering at Harvard SEAS. The team of researchers, led by Capasso and postdoctoral fellow Francesco Aieta, has developed a design that rivals the bulky equipment currently used in photography, astronomy, and microscopy. It could also enable the creation of new miniature optical communications devices and find application in compact cameras and imaging devices. 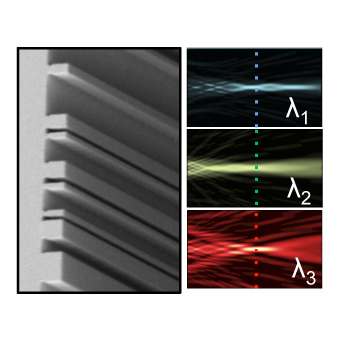 The new lens, dubbed an “achromatic metasurface,” dramatically improves on the flat lens Capasso’s research group demonstrated in 2012. That prototype, the first of its kind, corrected for some of the aberrations of conventional lenses but suffered from the limitation of only focusing light of a single wavelength, and its focusing efficiency was small. The new model uses a dielectric material rather than a metal for the nanoantennas, a change which greatly improves its efficiency and, combined with a new design approach, enables operation over a broad range of wavelengths. Most significantly, the new design enables the creation of two different flat optical devices. The first, instead of sending different colors in different directions like a conventional grating, deflects three wavelengths of light by exactly the same angle. In the second device, the three wavelengths can all be focused at the same point. A flat lens can thus create a color image—focusing for example red, green, and blue, the primary colors used in most digital displays. The team’s computational simulations also suggest that a similar architecture can be used to create a lens that collimates many different wavelengths, not just three. Harvard's Office of Technology Development has filed for a provisional patent on the new optical technology and is actively pursuing commercial opportunities. “Our previous work on the metallic flat lens produced a great excitement in regard to the possibility of achieving high numerical aperture and spherical aberration-free focusing with a very compact design. By demonstrating achromatic lenses we have now made a major step forward towards widespread future application of flat optics that will certainly attract the interest of the industry,” said lead author Francesco Aieta, now employed by Hewlett Packard, who conducted the research at Harvard SEAS. Additional coauthors of the Science paper include Mikhail A. Kats and Patrice Genevet, both former members of the Capasso laboratory. Kats, who earned his Ph.D. at Harvard SEAS in 2013, is now an assistant professor at the University of Wisconsin, Madison. Genevet, formerly a postdoctoral research associate at SEAS, is now at the Singapore Institute of Manufacturing Technology. This research was supported in part by a MURI grant from the Air Force Office of Scientific Research (FA9550-12-1-0389), with additional support from Draper Laboratory (SC001-0000000731), and the National Science Foundation (NSF, ECCS-1347251). Fabrication was performed at the Harvard Center for Nanoscale Systems, which is a member of the NSF-funded National Nanotechnology Infrastructure Network.